A great landscape starts with a great plan and creating gorgeous green living spaces is our specialty. We’ll work with you to make your vision a reality by designing an outdoor space perfectly suited to your home and lifestyle. Whether you want to landscape your entire property or revamp your entryway, our designers can create a custom look for you. Our plants — and plans — are distinctive, adding beauty to your space year-round. Relax, escape & enjoy. 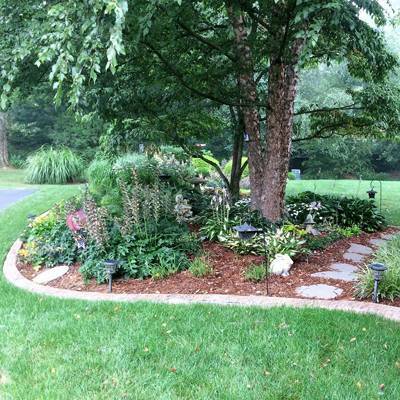 A beautifully landscaped yard not only adds value to your property, it creates a welcoming oasis year-round. We’ll listen to your ideas & then craft a thoughtful plan to make your vision a reality. Because we grow most of our own plants, we know what works well here. We’ll choose plants well-suited to the soil, climate, & environment to ensure long-term success. Whether your goal is to redo your entire yard, hide an unsightly area, or create magical outdoor rooms, we can assist you. Our landscape designers, architects & certified Kentucky nurserymen and women offer innovative & inventive plans, plus sound advice & installation services.